Got cleared for "social media" by American Ninja Warrior. I'm competing in the (once secret) Military Episode in June (in California). I'm going to kick arse and try to win the 1 million dollar prize money for Shriners Hospital. I'm also raising money for them (not for me) so no matter how I do, Shriners still wins. Please share, tweet, text this video to help get the word out. Good luck amigo! You'll kill it! Shared to FB and donated. Great job Chris. Bump this or PM me next Tuesday to remind me and I'll see what I can do with a donation. Shriners rock and so does CMoore. I didn't realize this until now. I follow Dana Linn Bailey on FB and she is competing On American Ninja Warrior as well. How cool is that. From what I can tell she will be competing in about 2-3 weeks?? Ya I believe she is competing in Baltimore! Yep. It'll be interesting to see how she does. I think she's on for Orlando (that's the next one up). Pittsburgh (end of May) and San Pedro (June, but .mil only) are the only other cities left afaik. 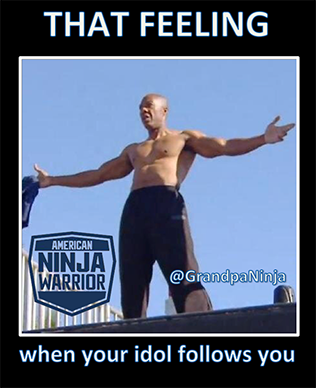 One of my all time favorite ninjas (@GrandpaNinja) started following me on Twitter (@cmoore_ANW).